Posted May 20th, 2009 at 5:07 pm. 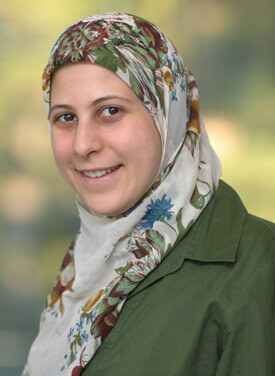 Sarah Khasawinah ’09, a double major in mathematics and English who spearheaded a $10,000 fundraising campaign to memorialize the victims of the 2007 shootings at Virginia Tech, has received a Graduate Research Fellowship from the National Science Foundation. The fellowship, which includes a three-year annual stipend of $30,000 in addition to a $10,500 annual tuition benefit, is offered to outstanding students in the sciences, mathematics, and engineering. Khasawinah, who completed both an A.B. and an M.A. this spring through the College’s combined A.B./M.A. program, will use the award to study biostatistics at the Johns Hopkins University. As a Mellon-Mays Undergraduate Fellow, Khasawinah has pursued research in pure mathematics, so the decision to take up applied math in graduate school represents a change in academic direction. Khasawinah, who has started an apiary club at Bryn Mawr, says that the change was inspired by the honeybees her family keeps in Virginia. At Bryn Mawr, Khasawinah has often found practical applications for her passions and ideals. The apiary club is an example: shortly before she graduated, the group had established its own hives at Harriton House, a local historic site. Khasawinah plans to return to campus for the first honey harvest. She expects the inaugural harvest to be modest, but estimates that the hives will eventually produce several hundred pounds per year. Another notable example is a multifaith running group Khasawinah started last fall after she learned that the Saudi Arabian team in the 2008 Olympics excluded women. As an observant Muslim, Khasawinah disagrees sharply with an interpretation of Islam that bars women from participation in athletics. Thirteen members of the group ran a half-marathon in Philadelphia in November, and many more attended runs and discussions the group sponsored. Members included Muslims, Hindus, Christians of various denominations, and a number of students who were practitioners of no religion but interested in exploring several faith traditions. Khasawinah’s deep interest in religion and spirituality has guided her choice of elective courses and ultimately led to her declaration of a second major in English literature, she says. “That title sounded very challenging, and I loved the course. After that I found myself taking a lot of courses that dealt with God, or with ethnic or religious identity in a postcolonial context—religion courses, comparative-literature courses, and so on. This year I realized that I had actually taken enough English courses to declare a major, and I thought it would be fun to do a senior essay project in English,” Khasawinah says. If Khasawinah discovered her love of poetry at Bryn Mawr, she arrived her with a well-developed appreciation for math, and she cites the close-knit, supportive math department as a key to her success. As a recipient of the Clare Booth Luce Scholarship for students in mathematics, Khasawinah played an important role in organizing department events, including weekly teas. “It was really helpful to be able to meet my professors in an informal setting,” Khasawinah says. For Khasawinah, perhaps her most satisfying graduation present was a check—not one she received, but one she signed. The Solidarity Project, an effort Khasawinah founded to create a scholarship fund at Virginia Tech in memory of the victims of the 2007 shootings, sent its check off to the Virginia Tech’s Hokie Spirit Memorial Fund during Bryn Mawr’s exam week. A native of Alexandria, Va., Khasawinah had several hometown friends who were attending Virginia Tech in April 2007 when an undergraduate killed 32 people and wounded many more before committing suicide. Within days, Khasawinah had started the Solidarity Project. Drafting participants from 33 colleges and universities in Pennsylvania, Khasawinah oversaw the creation of t-shirts imprinted with the logos of the schools involved. She recruited a local business to donate the printing, bringing the cost of each shirt down to $3. She and her collaborators at other schools sold the shirts for $10 apiece, and the group ultimately collected nearly $10,000.